Music by Ben Daglish and Anthony Lees. Originally released for the Commodore 64 in 1987. Converted for the Acorn BBC Micro and Electron computers by Peter Scott, and published by Superior Software in 1988. Converted for the IBM-PC compatibles in 1988 by Tanager Software: Programming by Peter Fokos; Graphics by Erol Otis; Title screen by Doug Barnett; Music and sound effects by Russell Lieblich; Technical engineering by Nicky Robinson; Produced by J. David Koch. Converted for the Apple computers by Tanager Software: Apple ][ programming by Peter Fokos and John Krocckel; Apple ][GS programming by Jeff Silverman; Graphics by Erol Otis; Apple ][ music and sound effects by Robert Kelly; Apple ][GS music and sound effects by Russell Lieblich and Don Harlow; Produced by J. David Koch. Apple ][GS version published by Activision in 1988 and Apple ][ version in 1989. 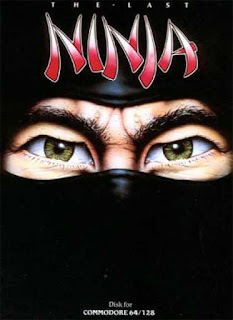 Remade as "Ninja Remix" for the Commodore Amiga and Atari ST by Eclipse: Programming by Marc Rosocha, Klaus-Peter Plog and Lothar Becks; Graphics by Hugh Riley, Erik Simon and Tim Lange; Music by Jochen Kippel; Published by System 3 in 1990. Originally converted for the Atari ST in 1988 by the same team as "The Last Ninja", but was never officially released as such. Converted for the Acorn Archimedes by Andrew Catling with music by John Bell, and published by Superior Software in 1992. Ninjas were in the latter half of the 1980's basically what the Jedi are once again, but there was an advantage to the coolness of ninjas: you could do many movies about them with a tiny budget. It was just a natural continuation from old kung fu movies with Bruce Lee and the likes, to ninja movies with very little known actors. So, with kung fu and karate games having already been made and remade numerous times, it was only natural that game developers moved on to ninjas. After having had such a huge hit game with International Karate, System 3's new ninja game was awaited with as much anticipation in late 1986, as gamers would now wait for a new Bethesda game, be it a sequel to Fallout or the Elder Scrolls. But The Last Ninja was about to be something completely different and, probably most importantly, would bring a notable change to the gaming rivalry dynamics. Designed by Yu Suzuki, and developed by Sega Amusement Machine Research and Development Department 2. Converted for the Amstrad CPC by Mevlut Dinc, with graphics by Focus. Converted for the Atari ST by Ian Morrison for Giga Games, with music by David Whittaker and graphics by Focus. Converted for the Sinclair ZX Spectrum by Alan Laird and Ian Morrison for Giga Games, with graphics by Focus. Published in 1987 for the Amstrad CPC, Atari ST, Commodore 64 and Sinclair ZX Spectrum by Activision. Also converted and published for the Thomson MO5 and TO8 computers by France Image Logiciels in 1988, but no further credits are known at this time. Also converted for the Sharp MZ-computers in 1989, but further credits are currently unconfirmed. Rewritten for the Sega Master System by Sega Enterprises, and released by Sega of America, Inc. in 1987. 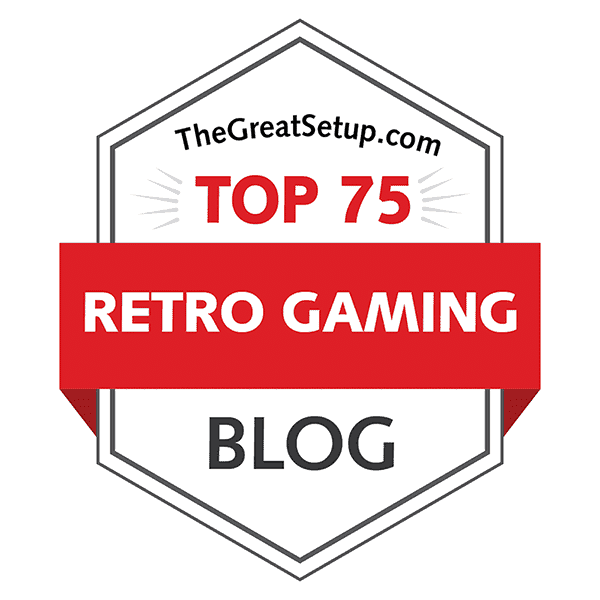 Here's a game, which I'm quite certain most retrogamers out there will consider somewhat of a disappointment in most cases, at least when it comes to any of the home conversions. Enduro Racer was basically developed as the dirt version of Sega's previous motorcycle racing game, Hang-On, and utilised either handle bars or a full-sized dirt bike on the cabinet itself. Missing these embellishments would make any of the home conversions feel and look incomplete, but due to its arcade hit status, it had to be ported on as many home computers as possible. 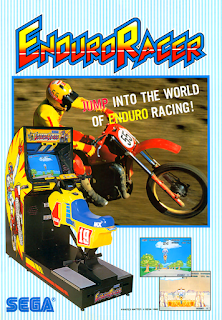 In Sega's own stroke of infinite wisdom, the Master System version was developed as a completely different racing game, but most of us fondly remember Enduro Racer as an awkward Hang-On clone.